On Thursday, February 5th, 2015, the i-MBA Career Office organizes a ‘L’Oréal Day’. Mrs Aggeliki Zarra, Integrated Marketing Communications Manager, and Ms Irene Dimou, Recruitment Executive, are invited to present L’Oréal Greece to i-MBA students and alumni. Mrs Zarra will discuss with participants “How Marketers Determine the Future of Business’, while Ms Dimou will present the recruiting process of the company. The event will take place at the Postgraduate Building of AUEB (47A Evelpidon str., 8th floor, room 802), 12.00-14.00. Students and alumni of the program that are interested in attending the event, are kindly requested to register by sending an e-mail at imba@aueb.gr. The invitation to the event is available here. For more than a century, we have devoted our energy and our competencies solely to one business: beauty. It is a business rich in meaning, as it enables all individuals to express their personalities, to gain self confidence and open up to others. L’Oréal is built out of 27 international brands, like L’Oréal Paris, Garnier, Maybelline, L’Oréal Professionnel, Kerastase, Redken, Matrix, Lancome, Biotherm, Helena Rubinstein, Giorgio Armani, Ralph Lauren, Cacharel, Vichy, La Roche-Posay etc. Each brand is unique and complementary but nonetheless only playing in one market- the cosmetics market. L’Oréal achieves its growth with a healthy balance between organic growth and strategic acquisitions of international brands. Our corporate culture is all about Passion and Energy! We have ambitious goals and we strive for excellence. This permanent learning experience helps employees to stretch their potential. Indeed, the quality and diversity of our teams is inspiring and encourages personal development. At L’Oréal we empower people who are ready to take bets, to think out of the box, to defend their convictions, to leave their own mark. They are offered numerous opportunities, fast track careers and early responsibilities. This is the engine that transforms a good strategy into an amazing success story every day. 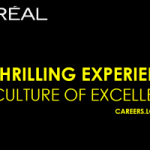 Thus, if you would like to join our team, please visit: www.careers.loreal.com or join us on Facebook, L’Oréal Greece!